Galle is a city on the South West coast of Sri Lanka. It’s famous for Galle Fort. A fortified old city founded by the Portuguese in the 16th century. Stone sea walls surround small European style streets that are free from cars. With architecture reflecting Portuguese, Dutch and British rule. 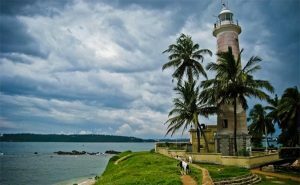 Famous buildings include Galle Lighthouse which stands on the fort’s southeast tip. Built by the Dutch in 1663. Galle is an Unesco World Heritage Site. This historic city is a delight to explore on foot. Visit the Dutch-colonial buildings, ancient mosques, churches, museums and grand mansions. You will pass stylish European style cafes, little boutiques and immaculate restored hotels owned by artists, writers, photographers and designers. The ramparts are so thick that you can walk along them. Start at one end and finish at the other. Look towards the ocean, see the old prison between the ramparts and the waves, check out the lighthouse and the clock tower and watch the schoolboys during cricket practice. The Maritime Archaeology Museum in a building inside the ramparts and was once the Dutch Warehouse. Groote Kerk the 18th-century Dutch Reformed Church and the Amangalla hotel are more examples of Dutch architecture. Inside Galle Fort you can walk along little streets and do some shopping. There are plenty of little shops and boutiques where you can buy plenty of local souvenirs and goods such as gems, jewellery, handwoven sarongs and home linen. The British may have officially left Sri Lanka but some British customs are still present. Afternoon tea is just one of them. The Amangalla Hotel is one of the Dutch buildings left in the Galle Fort and in the eighties, it was used in a music video by Duran Duran. 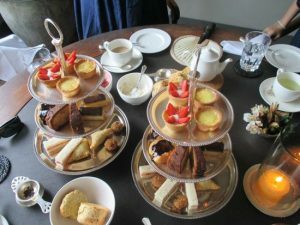 The afternoon tea at the Amangalla Hotel is top notch and definitely worth a try.